I was in Motijheel Government School until the 10th grade. I was always very involved in extra-curricular activities like sports and debate. Dhaka College, on the other hand, was very different and interesting. There were people from all over the country and I faced a very different atmosphere. College (Grades 11 and 12) was definitely the time that I really got to embrace freedom. I learned how to mingle with different crowds of people. I joined North South University (NSU) to study BBA. University was when I did everything but study. I got involved with the North South Cine and Drama club of the university (NSUCDC). I became quite popular and soon got involved in lots of in-house dramas. In the year 2000, I was made the president of NSU's Shangskritik Shangathan (NSUSS). I got involved in arranging lots of events and gained a lot of experience. Soon after that, I studied the art of stand-up comedy by reading different books and got involved in television and anchored shows. Then after a long gap from entertainment, in 2010, 'Mirakkel', a stand-up comedy show from Kolkata, came to Dhaka for auditions. My friend, Rajon, asked me to go to the auditions. I was least interested to do so, but later on found out that he had entered my name! After my audition, I remember the feedback for my performance to be 'sharp concept, but poor delivery'. They gave me a second chance and soon I had the judges laughing their hearts out. They, eventually, took me to Kolkata for the show and I became 'performer of the day' for four episodes. But it was not just 'fun' for me; I made sure that I got some kind of message or the other through to the audience. I distinctly remember in one episode, Poran Bannerjee, a judge, came to the stage and hugged me after my skit. The anchor even announced that it was the first time that had ever happened. When it comes to inspiration, apart from my love for my work, it is my audience. When someone would come and say, 'You CANNOT lose. You HAVE to win!' during my days at Mirakkel, I would find inspiration in that. I joined Naveed's Comedy Club soon after my return to Dhaka. Even though it started out small, Naveed's Comedy Club is booming with people who want to make others laugh, which shows that more people are interested in this field of work. 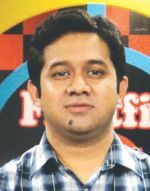 I am also involved with Dhaka FM where my friend, Yamin, and I do a show every Thursday from 6:30 pm to 8:00 pm every evening called Foolish Checkpost where we talk about the every day situations in our lives, of course, in a funny way. What I think is that every one needs to laugh. We live in a country where lives are hectic. If everyone just laughed for even 5 minutes in a day, and if I could make that happen, my day, along with theirs would go excellent. I find the ultimate joy in making people laugh. For the young hopefuls out there who want to pursue a career in stand-up comedy, I would just like to say that you have to keep your eyes and your ears open at all times and keep a fresh mind. You cannot let sadness cripple your thoughts and imagination. You have to find the ability inside you to find the joy and happiness in every situation.